February 10, 2019 8:30 pm. Douglas Whyte waved farewell to the most successful race-riding career in Hong Kong history this evening (Sunday, 10 February) at Sha Tin Racecourse, bowing out after saluting his fans long after the last race had weighed-in. 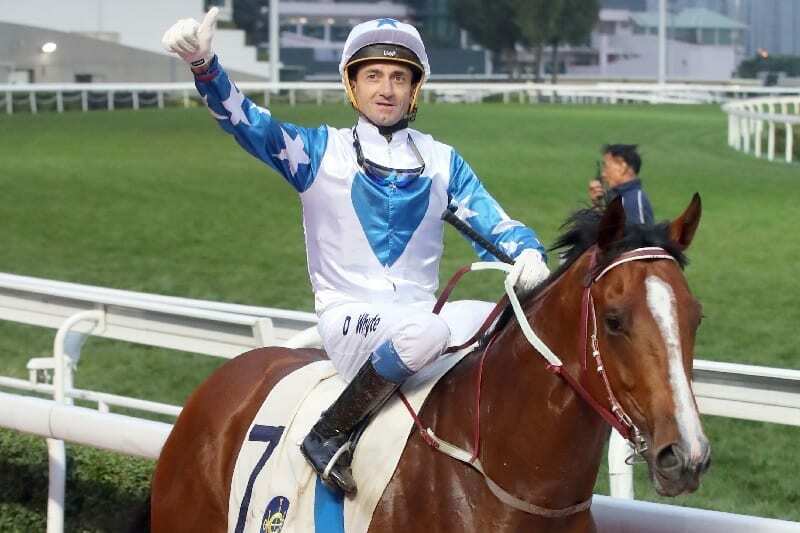 The 13-time champion jockey’s final ride did not produce the fairy tale victory that he and the Sha Tin faithful desired, but the day delivered heart-warming displays of respect and appreciation for a sportsman whose achievements have lifted him high into the pantheon of racing’s legends. Whyte retires with a Hong Kong career total of 1,813 wins – 894 more than current champion Zac Purton – total stakes money of HK$1,587,210,086.67, multiple Group 1 scores and, of course, his defining 13 consecutive premierships (2001-2013). His win strike rate over more than 22 years riding at Happy Valley and Sha Tin stands forever at 14.78%. The man they call the Durban Demon was “overwhelmed” in particular at the send-off he received from his jockeys’ room colleagues, for so long his unwavering rivals. “Behind the gates (before the last race) it was quite emotional because the starter, Tony (Speechley), said a few words and all the jocks gave me a hip-hip-hooray, so it was a really nice send-off. You get a bit of a lump in your throat but I still had a race to ride,” Whyte said. Whyte’s blank on his final day was not for the want of trying but did owe something to a stroke of misfortune. Two seconds were his closest placings – Mr Croissant in race two and Seven Heavens in the eighth – but the near-miss came when he rallied the impeded Storm Signal close home in the seventh contest, only to take third. “I would have won the race,” he said. “That’s the only bittersweet ending to the day. I’d have loved to have had a winner but I’m happy with the way every horse ran and the way I rode every horse. “I’m leaving on a high but I would have won on Storm Signal. I was just gaining momentum, I was coming to win the race and when you get knocked sideways like that – then the horse on my inside turned my hindquarters and he lost momentum and still picked up. Earlier, Whyte received a silver dish and a commissioned painting from the Jockey Club. That came after race four, before a parade ring full of his weighing room colleagues, trainers, media, and family, with a few thousand appreciative spectators looking on. “That was emotional. Thank goodness they didn’t give me a mic straight away because I wouldn’t have been able to speak. I don’t often cry but possibly I would have,” he said. A group photo with his fellow riders followed – and then the ambush. Vincent Ho and Silvestre de Sousa moved quickly, grabbing Whyte and lifting him into the air as other jockeys moved in, throwing the champ skywards and catching him three times. “All the guys in the jockeys’ room wanted to do something that was going to be special, something he’d remember the rest of his life,” Umberto Rispoli said. “We discussed with Joao (Moreira) that we’d lift Douglas up and so the signal was that I’d whistle and we’d bring him up. After the lifting, Rispoli launched the first wave of champagne spray, Ho followed with a second bottle and then Karis Teetan directed a drenching gush of bubbles from the flank; Joao Moreira and de Sousa moved in to pour the bottles’ remnants over the retiring hero whom the Jockey Club has licensed as a trainer for the 2019/20 season. Whyte took it all in good spirits. “It shows a lot of respect over the years of rivalry we’ve had – there’s a good side to everybody,” Whyte said. “We’re competitors and when we go out there we’re fierce, we’re rivals, and it’s nice to see that side of them. “I will say, the first time they threw me up in the air I went to put my hands down because I was expecting more of them to walk away! But the second time I got a bit of guts and held my hands out. It’s nice, it’s overwhelming. Purton had set the tone for the celebrations before Whyte stepped out from the Parade Ring wings. The arch rival went down on one knee and “shoe-shined” the legend’s boots, to the huge delight of watching fans. Enrichment (122lb), meanwhile, all but booked his BMW Hong Kong Derby (2000m) berth with a solid victory in the Class 2 Daffodil Handicap (2000m). The John Size-trained gelding had shown up well in three starts over a mile this term and relished this afternoon’s longer trip. Jockey Joao Moreira rated the Australian import at the head of the main pack, biding his time as Packing Warrior (123lb) cut out the running from Charity Go (123lb). Charity Go took the lead from the fading front-runner with 350m to race but Enrichment galloped past both of those fellow Derby wannabes to win by a length and a half in 2m 01.27s. The five-year-old Savvy Six (123lb) stayed on to mug Charity Go for second. “Enrichment does have the quality and he should get in the Derby, he deserves that,” Moreira said. “He’s the kind of horse that likes a good, strong tempo, he’s a proper stayer. Another Derby hope, Tigre Du Terre, was scratched from the race when he reached the start. Trainer Jimmy Ting took the opener when apprentice Dylan Mo made all on Richcity Fortune, and another local rider, Keith Yeung, drove the Benno Yung-trained Chiu Chow Kid to victory in race five. Mo nailed a brace when the Peter Ho-trained I Am Power was a cosy winner of the 1000m Class 3, from the Whyte-ridden Seven Heavens. The early part of the card brought a good debut for the Dennis Yip-trained four-year-old Prince Of Gems, who took the Class 4 Cineraria Handicap (1200m) by a length and a quarter under Zac Purton. Race four saw the three-year-old Coby Oppa live up to his American dirt pedigree to win the Class 4 Daisy Handicap (1200m) under Karis Teetan. Frankie Lor’s charge was having his second outing and his first on the all-weather track. Trainer Tony Millard was at the Inglis Classic Yearling Sale in Australia but that didn’t stop his Hong Kong International Sale Graduate (ISG) Super Star improving his record to two wins from four starts in the Class 4 Orchid Handicap (1400m). Silvestre de Sousa was in the plate for that success and the in-form Brazilian wrapped up a treble for himself and Lor when another ISG, the six-year-old Noble De Love, won the Class 3 Peony Handicap (1200m) on the dirt, followed by Right Choice in the finale, the Class 3 Rose Handicap (1400m). That last race saw Whyte deliver the John Moore-trained debutant Uncle Steve on a well-judged run to place fourth, despite breaking from Gate 14. It may have been a defeat but the ride reminded the Sha Tin faithful exactly what they will be missing now that one of the sport’s finest tactical minds has hung up his saddle.